Имате въпрос към Xin Penang Apartment? Ако това, което търсите е хотел с добро местоположение в Пенанг, не се колебайте, а изберете Xin Penang Apartment. Хотелът се намира се на 4.4 km от центъра на града, поради което неговите гостите могат безпроблемно да се наслаждават на всички градски атракции. С удобното си местоположение хотелът предлага лесен достъп до всички градски забележителности, които задължително трябва да се видят. Xin Penang Apartment също така предлага много съоръжения за обогатяване на Вашия престой в Пенанг. Хотелът осигурява безплатен WiFi достъп във всички стаи, Wi-Fi връзка в общите части, паркинг, семейна стая, ресторант, за да гарантира комфорта на своите гости. Като допълнение всяка хотелска стая предлага широка гама от удобства. Много от стаите са с телевизор с плосък екран, достъп до интернет (безжичен), безжичен интернет достъп (безплатен), стаи за непушачи, климатик, за да удовлетворят и най-изискания вкус. През деня можете да се насладите на отпускащата атмосфера благодарение на фитнес зала, голф игрище (в радиус от 3 км), открит басейн, детска площадка, басейн (за деца). Каквито и да са поводите за Вашето пътуване,Xin Penang Apartment е най-доброто място за престой, което можете да изберете в Пенанг. This property is independently operated by an individual owner. It is a private unit of vacation home and therefore does not have a check in counter. The owner will arrange a session of ‘Meet & Greet’ for key handover and familiarization of the property. You will have access to owner’s contact details in case of any query of the property. Great staff and spacious room. Location is good. Near to Queensbay mall.... Great swimming pool and tight security. my experience it was all great! We stay here for a night only. To find it just search for 1st sky apartment if not u will get lost. We meet a kind n friendly owner , MR Tony and his assistant. They were very helpful also. The apartment is very nice , comfortable and pleasant to stay. If u wish to swim@swimming pool, then please use proper swimming suit . Hope to stay here again. Nice, clean and spacious. It is recommended to contact the owner earlier before your arrival to avoid long waiting time. Although it was an apartment, it was more spacious than a terrace house. Consists of three rooms, spacious combined kitchen+dining+hall area, two bathrooms and breathtaking view from the balcony. Have a swimming pool (should wear swimming attire) and gym. Two car parking and noise free area for relaxing. Overall had a great stay. The sink water pressure was low but otherwise, everything else is great. Отседнахме 6 вечер/и в май 2016 г.
Im staying for 7days with My Group 8person, The owner was Very helpfull, Waiting us ti night&help us To guide The Driver reached The place. Near SPICE arena & bayan lepas. We have stayed in several units at 1-Sky Condo. Like the facilities and the convenience as our relatives live nearby. We were grateful that Mr Tony was able accommodate our request for early check in. 2 parking lots were provided. Shower foam and shampoo were provided. Overall our stay was okay, however, may I suggest some improvements? 1. Safety for kids - extra lock for sliding door to balcony, extra lock the room windows, extra lock for yard door, wall up yard area. 2. Cleanliness - ensure curtains are washed, de-clutter coffee table (found outdated newspapers, outdated supermarket pamphlets and etc), de-clutter TV cabinet. 3. Added value - install shower curtain in bathrooms, change the dirty water hose to bidet shower, change cover for ironing board, cover the washing machine with proper cover. owner is very helpful in all ways. nice & big apartment, clean & tidy as well. the apartment is nice & big, clean & tidy as well. 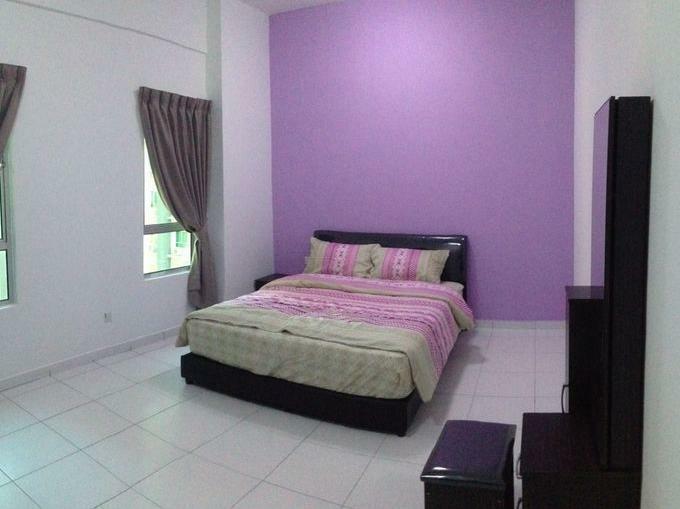 the location is ease to find and its nearby to the penang airport. near the apartment have lots of restaurant to choose. Short n sweet..mission accomplished to have a comfortable and convenient lodging with little children around.. Very memorable. We enjoyed the pool and the playground a lot. The apartment is very clean and comfortable. complete with home appliances that you can use. Very accommodating owner Mr. Tony Lee. didn't hesitate to offer us a ride. We only stayed for a night. It was very short. We are looking forward to staying at Xin again soon, that time for a longer period. The owner Tony was friendly and helpful. We did not expect to have no bath towels provided (we have been using homestay for couple years and always been provided towels), but Tony accommodated our needs by sending some for our use. The property is good and big. It will be better if the shower room come with shower curtain to avoid wetting the whole bathroom floor. this apartment is very well maintain. very nice rooms and comfortable. very big swimming pool. really enjoy our short stay at this apartment.